Lemon is one of the most commonly used ingredients when it comes to the culinary arts. It has the ability to bring its own tangy flavor and enhance the dish’s other flavors. The lemon is said to be a “flavor catalyst,” meaning it opens the taste buds so the flavors that follow it are more prominent. 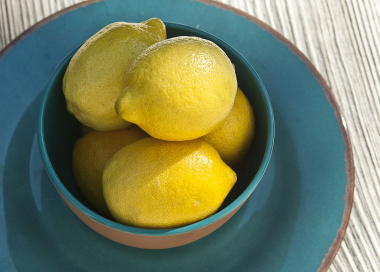 Aside from their culinary advantages, lemons have many health benefits. They contain large amounts of vitamin C, as well as riboflavin, thiamine, iron, magnesium, pantothenic acid, fiber, vitamin B6, potassium, copper, calcium and folate. 1. They fight free radicals. Free radicals are microscopic annoyance that are responsible for damaging cells and cellular membranes. They can cause inflammation, chronic diseases and accelerated aging. The large amounts of vitamin C in a lemon neutralize the free radicals. It also helps prevent the buildup of free radicals and can aid in stopping the progression of atherosclerosis and heart disease in diabetics. 2. They boost your immune system. Punch your flu in the face by boosting your immune system. The citric acid, bioflavonoids, vitamin C, calcium and pectin are your immune system’s sidekick—they will boost your immune system and keep infections at bay. 3. They protect your cells from cancer. Lemons contain limonene which has been shown to halt the growth of cancer tumors in animals. The limonoids in citrus fruits can protect the cells from damage that can lead to cancer, according to a 2005 study published in the Journal of Nutrition. 4. They neutralize chemicals in your body. Our bodies are naturally acidic and lemons, when metabolized, become alkaline. This reduces our body’s overall acidity, which draws uric acid from the joints. This can reduce the pain and inflammation, which many people feel in their joints. 5. They increase your energy and alertness. 6. They keep your intestines, running smooth. Lemons are a good addition to help you intake enough fiber. The fiber in lemons will help you avoid becoming constipated or developing hemorrhoids. Fiber has also been shown to decrease the risk of developing conditions such as diabetes, heart disease, and diverticulitis. 7. They improve your mood. Turns out lemons, do not make sour people. Lemons contain more negatively charged ions that when reacted with positively charged ions create a positive reaction. This reaction will boost improve your mood and elevate your energy levels. They promote clearer thinking and help reduce anxiety and depression. 8. They remove toxins and waste. Lemon juice is similar in atomic composition of the digestive juices and saliva found in your body. This allows lemons to do a great job at breaking down the material, encouraging the liver to produce bile, and helps you flush away unwanted materials and toxins from the digestive process. 9. They make your skin clearer. Lemons help to push toxins from the body and support healthier liver functions. This results in skin that is clear and supple. The vitamin C in lemons can decrease wrinkles and blemishes. The way to clearer skin starts with good nutrition. 10. They reduce the chance of kidney stones. Kidney stones develop from an inadequate amount of citrate in your urine. Lemons raise the levels of citrate in your body, helping to prevent kidney stones from developing or being enlarged. 11. They decrease your blood pressure. Lemons are also high in potassium which helps to keep blood vessels soft and flexible. This will reduce your blood pressure. The vitamin B found in lemons is also beneficial to your heart. A lemon has three distinct parts that can be consumed: the juice, the carpels, and the zest. The juice can be squeezed on your meals, mixed in with drinks, or used to make pure lemon juice. Mixing lemon with water is a good way to give your water some flavor, so that you drink adequate amounts of water in a day. The carpels are the inside segments that you can eat. You can eat them raw, but many people find the juice too strong. A good way around this is to squeeze the juice into a separate container for different use and then eat the carpels. The zest is the outer colored part of the peel that is often used to flavor foods. To make zest, place your lemon peels in the freezer for a couple of hours. Then take the peels and grate them.